Size: 6” X 9” * over 50 bw photos * 160 pp. Available now in Chicago at the Bike Lane, Blue City Cycles, the Book Cellar, Boulevard Bikes, Ciclo Urbano, Hard-Boiled Records, Lugs Chicago, Maria's Community Liquors, Myopic Books, Rapid Transit Cycle Shop, Quimby’s Bookstore, Upgrade Cycle Works, Uptown Bikes and Yojimbo’s Garage. “As John spins his yarn across the U.S. via roads, paths and pubs, you’ll wish at some point you’d gone along.” – Dave “Mr. Bike” Glowacz, author of Urban Bikers’ Tips and Tricks. 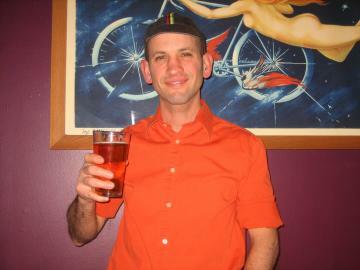 In Bars Across America, longtime Chicago bicycle and beer advocate John Greenfield tells the story of his 5,000-mile bike journey from Astoria, OR, to Portland, ME, stopping to check out 48 taverns along the way. Every other day or so he would take a break from the hot pedaling, duck into a watering hole, jot down notes about the décor, and get the skinny from the local barflies. He stopped at the Silver Dollar Saloon at the bottom of a canyon in Idaho, and Kerouac’s favorite dive in Denver. In Paxton, NE, Ole’s Big Game Steakhouse, filled with stuffed African wildlife, was a welcome oasis. He joined thousands on the rowdy RAGBRAI ride across Iowa, then led a pub roll to celebrate the striping of new bike lanes on Chicago’s Milwaukee Avenue. After experiencing a Parrothead party on the Canadian Riviera, he reached the ocean at Revere, MA, and celebrated at the Shipwreck Lounge, sadly destined for the wrecking ball. Along the way Greenfield met other scruffy cyclists, cowboys, carnies and lonely ex-cons. 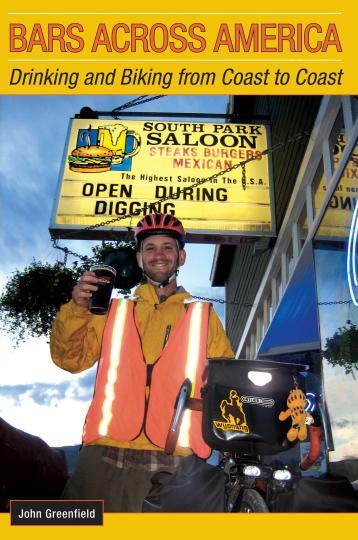 Part travelogue, part guidebook, part ode to the vanishing community tap, Bars Across America is the story of one man’s two-wheeled trek in search of the perfect pint. In 1997, John Greenfield became the first of many to spend the night in jail for riding in Chicago’s monthly Critical Mass bicycle parade. As head of the Ukrainian Village Draught Beer Preservation Society, he led pub crawls to highlight the value of neighborhood bars, and came up with the name and concept for Chicago’s bike-friendly Handlebar bar and grill. His writing has appeared in Bicycling, Momentum, Dirt Rag, Cog, Kickstand, and Urban Velo, as well as his blog, votewithyourfeetchicago.blogspot.com. So far, Greenfield has pedaled the perimeters of Chicago, Lake Michigan and Illinois, plus three sides of the continental U.S.